America is turning 240 this year and she’s never looked better! The 4th of July or Independence Day holiday is upon us and for many, it’s a chance to show our patriotism while decorating our homes for a big summer celebration. You may be looking to hold a party or an outdoor cookout or you might simply be updating your home’s interior or exterior to look right for the summer. Whatever the reason to decorate, you know that many of the items you need have to eventually be stored for a good portion of the year. A.B. Richards knows that too and we have portable storage containers that can simplify your 4th of July needs. We also want to share some ideas about storage for this unique holiday. There’s an obvious color scheme to most July 4th decorations and it’s red white and blue. The most important item you may need to store for your celebration is the US flag. Remember, that our flag should always be handled with care. The US Flag Code, which are the guidelines passed by Congress on display and care of the national flag says, “No disrespect should be shown to the flag of the United States of America.” The code also states that “the flag should never touch anything beneath it, such as the ground, the floor, water, or merchandise.” One longstanding tradition regarding the storage of an American flag is to fold it in a triangular shape with only the blue section showing, according to the American Legion, which posts instructions and guidelines for flag folding on their website. 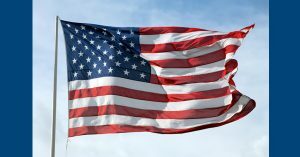 Another decorative item associated with the July 4th holiday is bunting, which are paper or cloth decorations, usually in the form of drapery that has the colors of the flag. Both flags and bunting can wear over time and need to be stored in areas that are dry, away from sunlight and free of humidity. A.B. Richards has 20ft storage containers that are perfect for storing household items. The 4th of July is often an ideal time to gather friends for a party. If your bash is an annual event, you may need to store items to get ready for the festivities. Extra tables, chairs, lawn chairs, games and athletic equipment may need to be stored. Cooking and grilling equipment that was packed away for the summer may also have to come out of storage. You may have plates, napkins, centerpieces and tiny flags for each table. If it’s a pool party, you might need to keep aquatic equipment and flotation items on hand. You may want extra space for lanterns, bug zappers and speakers as well as for any music equipment. There’s one item that’s associated with July 4th that you need to be very careful with, and that’s fireworks. You should know that most states in the northeast have strong restrictions on consumer fireworks. Delaware, Massachusetts and New Jersey ban all types of fireworks, according to the American Pyrotechnics Association. Meanwhile,16 states including New York, Connecticut, Pennsylvania and Rhode Island ban all but items such as hand held sparklers or other novelty items. Aerial displays are usually only legal if those who possess them apply to local authorities. It’s usually required that those seeking permission to put on major displays be heavily insured. If you are permitted to store consumer fireworks you should keep them in a dry, secure location. A.B. Richards wants you to enjoy a safe holiday weekend. If you have storage needs, we likely have a mobile storage unit that will be right for you. If you need a lot of space at home or if you have a business that has to store seasonal items, A.B. Richards has 40ft containers or 40ft Jumbo containers with an extra foot of headroom available to meet your portable storage needs. Our storage containers are sturdy and secure. Contact us today to get started.